The telephone at my home rang at around 1 am, early Sunday morning. Prime Minister Yitzhak Shamir was on the line, and he was fuming. a few hours after four truck bombs rammed into two local synagogues, killing nearly 30 people. The images were shocking. Behind the Jewish man, whose shoulders were trembling, one could see streams of blood – the blood of Jews who had been murdered a short while ago. The street had not been cleaned yet. The reporter asked the Jewish man, who was wrapped in a Tallit (prayer shawl), if he was scared. The man replied, "No. I'm not scared." The reporter then asked, "How is it that you are not afraid?" The Jewish man answered: "Because the State of Israel exists." Shamir, who was clearly agitated, said to me that when his father was warned in Poland that the extermination of all the Jews - himself included - was imminent, he replied: "I have a son in the Land of Israel, and he will exact my revenge on them." With this short exchange, Shamir encapsulated his life lessons and the mission he felt he was on throughout the various chapters of his turbulent life – from the days of Lechi (Shamir was one of the militant Zionist group's leaders), to the prison camp in Africa, from which he managed to escape shortly before the State's inception, to his days as a Mossad fighter and commander and later as the prime minister of Israel. Shamir did not anticipate a political career, and he did not prepare himself to become prime minister. He was never involved in any sort of maneuvering that characterizes party politics, and felt quite uncomfortable in this environment. He was a very private, closed up man who spoke little and felt uneasy at public gatherings. He preferred to sit on the second floor of the Prime Minister's Residence, drink tea prepared by his devoted wife Shulamit, and write in his notebook. I had the privilege of being in that small room with him on several occasions, particularly during times of crisis, when a determined, clear stance was required. Shamir did not speak harshly or make bombastic statements, but he was decisive, firm and precise. His position was clear, and he never hesitated to express it, even when he knew it would stir anger, disagreement and perhaps even criticism in Israel and abroad. As prime minister, Shamir was unyielding. He rejected Roni Milo's suggestion to withdraw from Gaza ahead of the 1992 elections, despite the fact that it could have helped his party gain more votes. It is too soon to determine when his obstinacy was beneficial and when it was damaging. We should not assume that Shamir would have acted today as he did 20 years ago, because he knew how to be a pragmatist and become more flexible when the circumstances demanded it. He participated in the Madrid Conference not because he believed it would bring peace, but because he believed Israel could not turn down such an initiative. When it was called for, Shamir took chances. The failure of the Madrid conference did not surprise him, but he never regretted participating in it. Shamir considered the immigration of Jews from the former Soviet Union a turning point that would determine the State of Israel's future, and he was always thrilled to greet groups of olim at the airport. "Remember, this aliyah is a great miracle," he would tell me. Towards the end of his life, Shamir mostly kept to himself. He rarely spoke to people – not even to members of his own family. After one of my final visits to Shamir's home, I asked Shulamit why he kept silent. "Because he fears that he will be incoherent and humiliate himself," she said. When a senior security official sought his advice on an urgent matter, Shamir told him, "I'm nearing 90. I'm not at all certain that what I will say to you will be what I would have said when I was young and lucid." There was so much wisdom and humility in this man. In their eulogies, people won't say that Shamir was a bold or charismatic leader who was able to excite his nation, but the toughness and self-control he demonstrated during times in which other prime ministers panicked never ceased to amaze me. 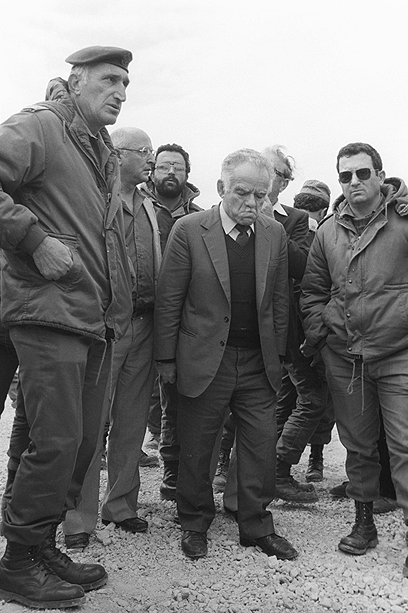 He was made of steel, determined and decisive; modest but proud of his Jewish heritage and, most of all, completely dedicated to the mission entrusted to him by his father, who died knowing that his son Yitzhak Shamir (Jeziernicky) would never let the Jewish nation suffer the same fate as his parents and many of his relatives did. See all talkbacks "Man made of steel "